Terra alba (CaSO4.2H2O) is the set Gypsum which acts as an Accelerator mixed with Dental Plaster to accelerate the setting reaction. 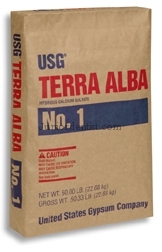 Terra Alba is also called as Calcium Sulphate Dihydrate. Setting time changes significantly with the amount of Terra Alba present in the mix, hence it is used in varying concetrations by manufacturers to alter the setting times of the mix. It is usually maintained at 0.5% to 1% concentration depending on the setting time required. Above 1% the effect of Terra Alba decreases and it does not show any significant change in Setting time. Terra Alba is grounded into a powder and mixed with Dental Plaster in concentrations between 0.5 to 1% depending on the setting time required.